Harrow Order is an Expert Advisor (EA) that works based on Support and Resistance, Martingale and Anti-Martingale methods. Support and Resistance is used to indicate the best position to place orders. Martingale is used to fix unprofitable orders. And Anti-Martingale is used for increasing potential profitable orders. This EA runs with two basic steps, namely try and execute. First, it will send one initial order to find out the market conditions at a nearest Support or Resistance level. Second, it will decide to execute the Martingale method if the profit of the initial order is negative, or Anti-Martingale if the profit of the initial order is positive. For initial order, it uses the Relative Strength Index (RSI) indicator as reference to take the buy or sell order. If the RSI value is more than 50, the initial order will be sell. And if the RSI value is below 50, the initial order will be buy. 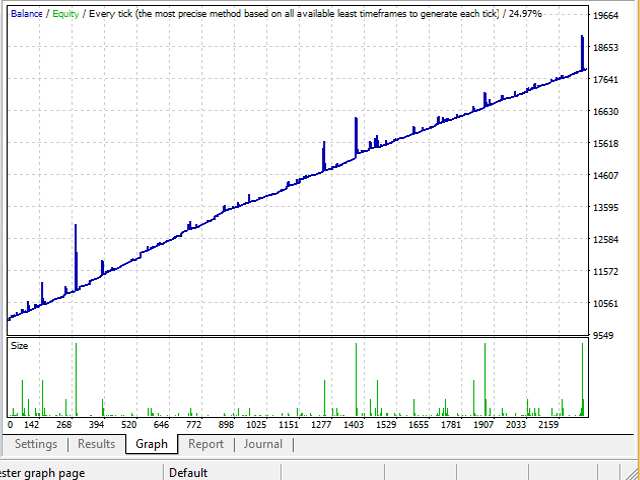 Martingale method is actually used to substitute the stoploss. Most manual traders close their negative orders early, when the price touches the stoploss value. This EA assumes that the early closing of negative orders is wrong and that stoploss action just will reduce the balance. To keep it profitable, this EA uses the Martingale method by sending the same order with double lots continuously, at least up to 8 levels (i.e. MaximumMartingale=8). So when the market price is moving back in the same direction as orders and then all orders are closed, there potentially will still be residual profits from the order with larger lots, after covering the losses of orders with smaller lots. 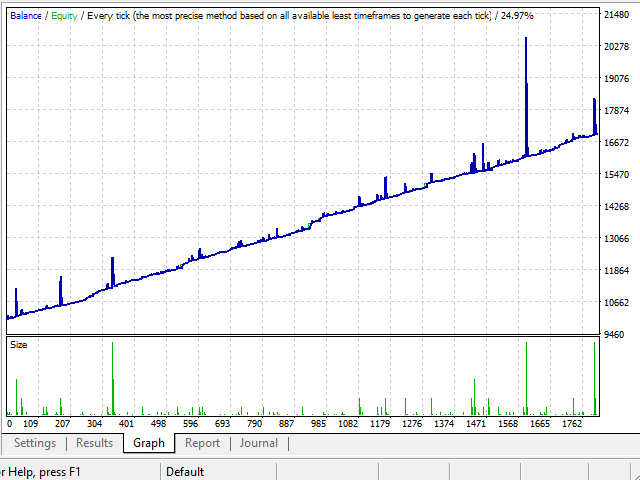 However Martingale method is a highly risk method, and to support it this EA needs lots and balance ratio 1:200000. That means that if initial order lot is 0.1, the required balance is at least 20000 USD. Or if only use lots 0.01, then the required balance is at least 2000 USD, etc. And the last, Anti-Martingale method is used when the initial order is positive. If the market price touches the next Support or Resistance level, this EA will send the same order but with half lots of previous order continuously. And if the market price starts to move back, all orders will be closed. So with the latest lot being the smallest of all orders, hopefully the losses of all orders will not be much and the series will still be profitable. 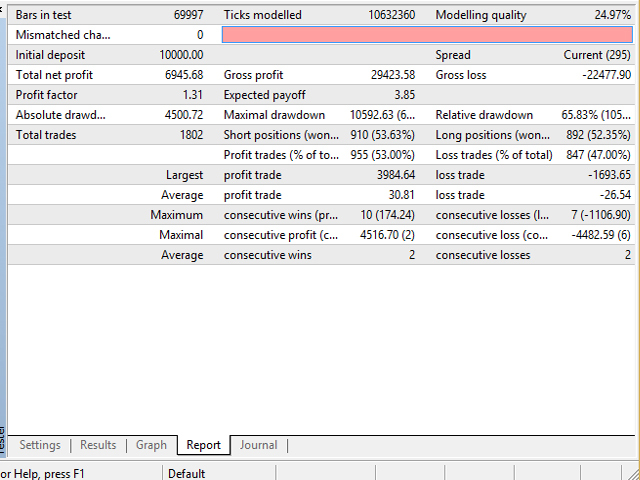 The examples of Martingale and Anti-Martingale methods of this EA are shown in the screenshot section. 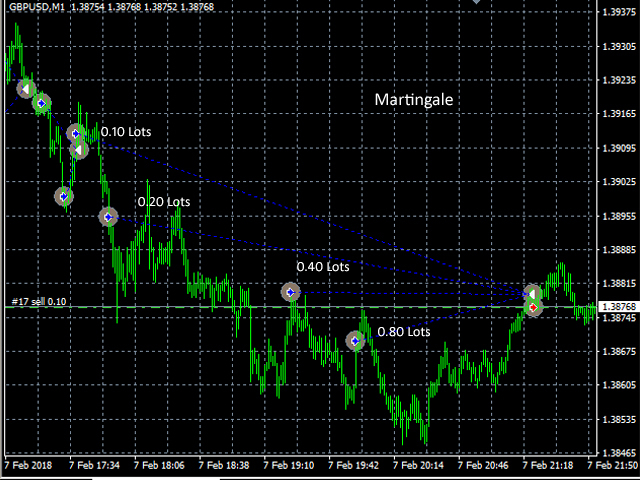 This EA is recommended for use on the EURUSD pair with the M1 timeframe. 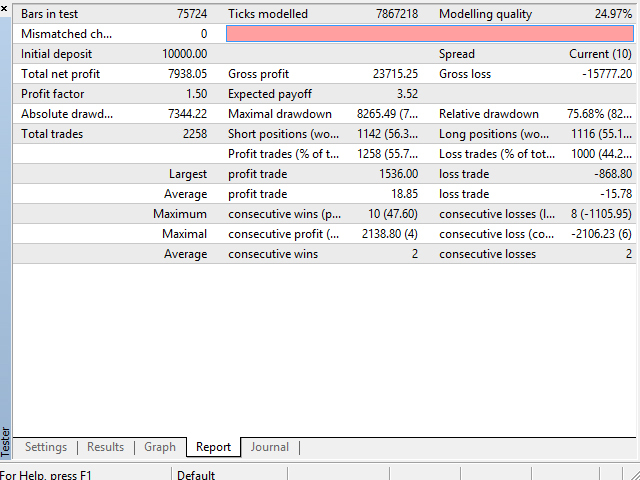 But it can also be used on another pairs like GPBUSD and XAUUSD, with initial balance as required below. The recommended balance for EA’s use is 20000 USD with Lots 0.1. MagicNumber. The mark number that is used to identify orders, which are sent and managed by this EA. If this EA runs on multiple pairs, every pair must be run with different magic number, exp GBPUSD 100001, EURUSD 200002, XAUUSD 300003. NumCandle. The number of candles that is used to calculate Support and Resistance. The default value is 120 candles. That is, if this EA is used at the M1 timeframe, 120 is equal to 2x60 minute or 2 hours. So Support and Resistance levels used by this EA are the Support and Resistance for the last 2 hours. CloseAtStop. The option to close or not all orders at Remove EA action. Only removes orders that have magic number specified in MagicNumber above. OrderLots. Initial lots value for the EA, it’s the lot value used for the initial orders. i.e OrderLots=0.01, 0.02, 0.04, 0.08, etc. MaximumMartingale. The maximum Martingale order. Default value is 8, i.e. the maximum Martingale multiplier is 27=256. If initial lot is 0.1, then the maximum lots would be up to 256x0.1=25.6 lots. DeltaLevel. Delta between two orders. It depends on the width of Support and Resistance. If the range is too narrow, the distance between orders can be widened by increasing the value of this parameter. Each broker has different characteristics or features, such as spread value, so please try this EA with strategy tester or demo account, before buying and using it on a real account.